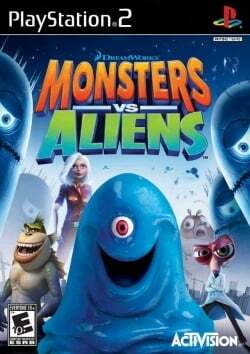 Game description: Based on the DreamWorks 3D feature film, Monsters vs. Aliens puts the fate of the planet in players' hands, to save the world as only a monster can. Bash, skate, and ooze as the macho half-ape, half-fish The Missing Link, the 49'11" tall woman, Ginormica, and the gelatinous, indestructible, and brainless B.O.B, with the help of the monstrous 350' tall grub Insectosaurus. Plus, team up with the brilliant but insect-headed Dr. Cockroach, Ph.D. in co-op mode, to save the earth from the megalomaniacal alien Gallaxhar. Unleash unique powers as all your favorite monsters from the film - The Missing Link: Bash, bounce, swing, tail whip, and climb as this prehistoric brawler! B.O.B: Ooze through cracks, stick to ceilings, and absorb and spit out enemies as this gooey blob! Ginormica: Tower over the landscape, test your strength, and use cars as roller-skates as this battling behemoth. Battle through locations from the movie and beyond - Adventure across 20 distinct levels set in locations from the film and beyond, including the streets of San Francisco, Gallaxhar's gargantuan spaceship, and the government's super-secret monster containment facility. Play as a team in co-op mode - A second player can pick up a controller and drop in at anytime as Dr. Cockroach Ph.D. As the most brilliant scientist in the world, players can blast apart robots, toss away enemies, plus grab hard-to-reach upgrades and other rewards. This page was last edited on 5 February 2017, at 18:17.